50 Years: Gary Unverzagt. 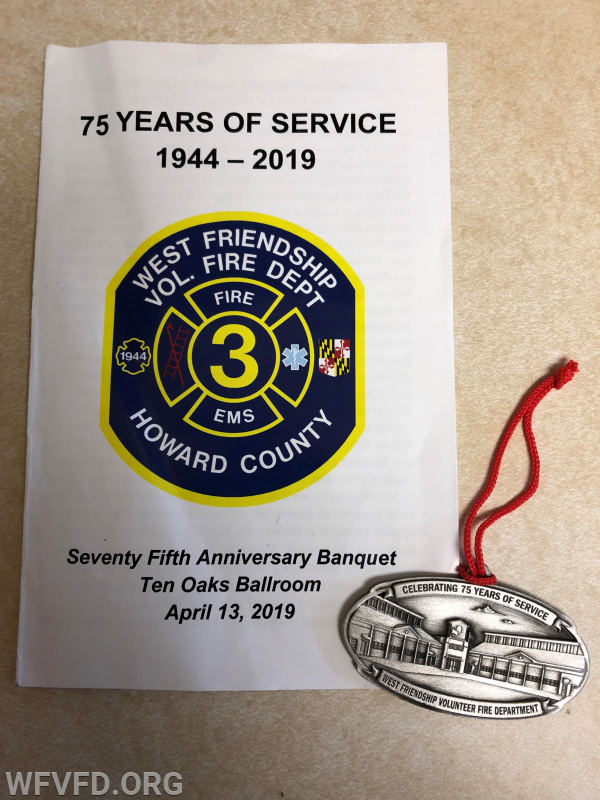 Gary (life member, and former Chief and President) was also presented with several citations recognizing his many years of service including a citation from State Senator Katie Fry Hester, an Executive Proclamation from Howard County Executive Calvin Ball declaring April 13, 2019 as "Gary Unverzagt Day", and a resolution from the Howard County Council presented by David Yungmann, Howard County Council District 5 council member. Chief Miller then presented Deputy Chief Mickey Day a Special Recognition Award for his many years of service as Chief of WFVFD. Top EMS Responders: Stan Kitzinger, Will Schwarz, Josh Dillon, Bambi Nelms, Eric Pelicano. Top Fire Responders: Patrick Jeffery, Zack Leaf, Scott Christiansen, Gary Unverzagt, Eric Pelicano. Top Combination Fire and EMS Responders: Josh Dillon, Patrick Jeffery, Zack Leaf, Gary Unverzagt/Scott Christiansen (tie), Eric Pelicano. Earl Molesworth Memorial Award (Outstanding Life Member): Ron Hoffman, Sr. Operational, Administrative, and Auxiliary officers as well as Board of Directors members were then sworn in by Chief Butler. After the benediction by Chaplain Ryan Eglseder, music and fellowship were enjoyed by all. We look forward to a successful rest of 2019 and the next 75 years!